When it comes to home shopping, buyers are turning to the internet more than ever before. In fact, prospective home buyers spend valuable time researching the home’s history, amenities, and price point before contacting the real estate agent. This new way of shopping means that you need to make a shift in your marketing strategy. Establishing your online presence and leveraging digital marketing is no longer optional for real estate professionals. You have to upgrade your playbook if you want to compete. In this article, learn more about the latest real estate digital marketing hacks you can use to attract more customers and sell more homes. 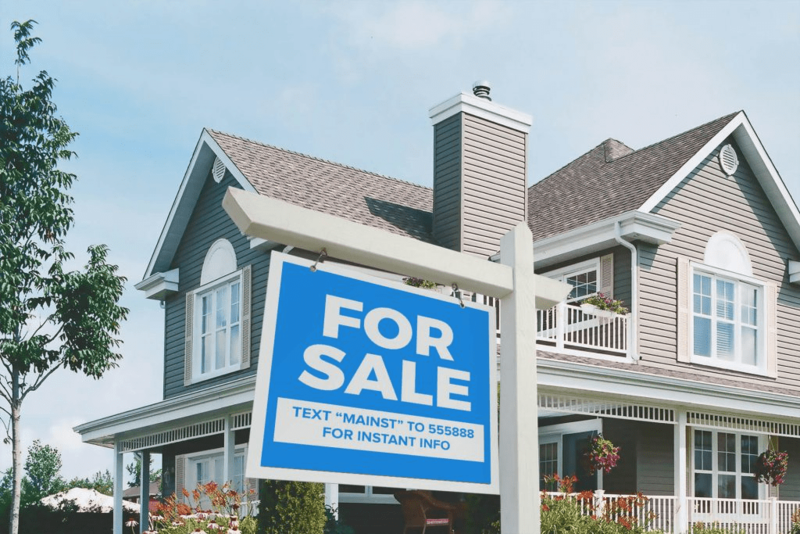 Over the years, we've helped thousands of real estate professionals use text messaging to maximize the effectiveness of their digital marketing efforts. Additionally, beyond text messaging, we've seen what it takes to really drive customer engagement. We’ve distilled this knowledge down into five quick and easy hacks that will revolutionize your digital marketing for your real estate business. For a real estate agent, a solid social media strategy is more than just posting a few photos and a link to a listing. You can choose to use any number of different social media platforms including Facebook, Twitter, Instagram, and LinkedIn. To use social media effectively, there are two main things that you will want to do. First, you need to make sure that you are posting regularly. You can use tools like Buffer and HootSuite to help make it simpler to spread your message across a variety of platforms in a time-efficient way. The fact is — during the home buying process, prospective buyers are inundated with messages from realtors. As a competitive realtor, you want those home buyers to choose you. To do this, you’ll need to stand out from the rest of the competition and work on building high-value relationships with online searchers. 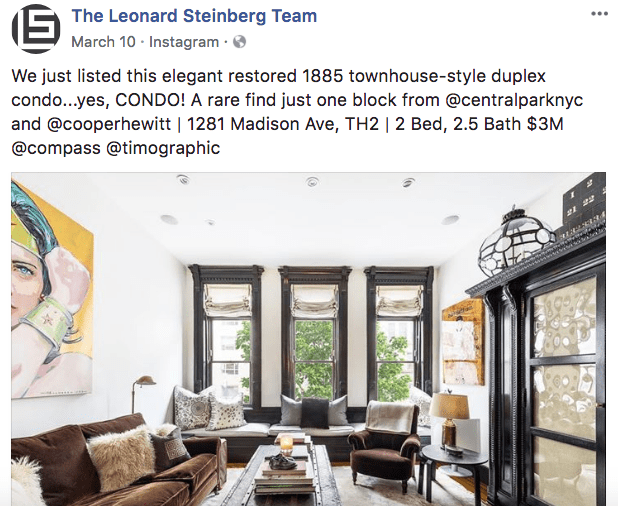 The Leonard Steinberg Team shared a flattering photo, listed the perks of the location, and shared a bit of the history of the apartment. 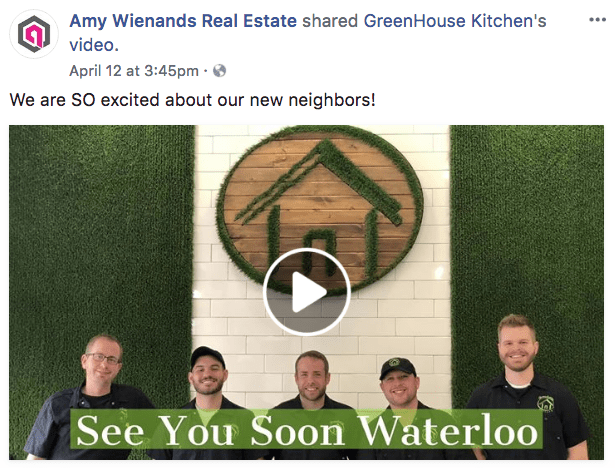 Amy Wienands Real Estate shared a post that gave a warm welcome to a new business in the area. This type of post shows that you know the area and are part of it, but it also has the dual benefit of encouraging the business you’re sharing to return the favor. 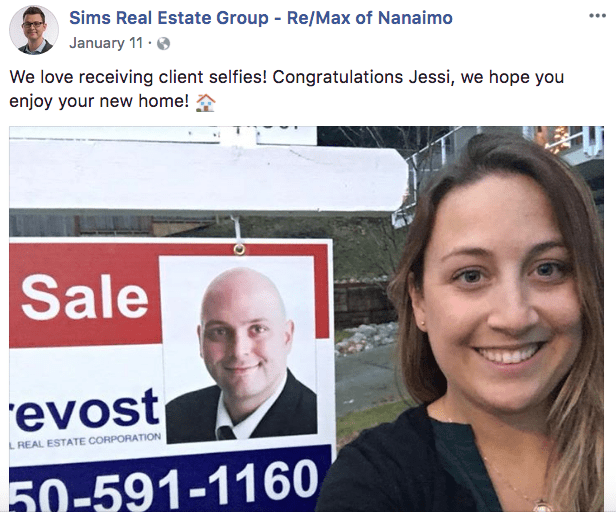 Encouraging clients to send you a selfie after they close on their new home is a great way to get those testimonials flowing. Sharing those client testimonials shows that you’re also celebrating those important milestones. When people are shopping for homes, they tend to want to share their top picks with friends and family. The best realtors create shareable links to new listings. As a best practice, be sure to test these buttons before adding to your listings. In most cases, share buttons should generate an image of the home, as well as a quick sentence or two about the listing. If any of these mission-critical components are missing, you’ll need to commit to some serious troubleshooting. An inactive or broken share button will quickly frustrate prospective home buyers. According to the National Association of Realtors, 62% of all home buyers prefer that their real estate agent sends them property information through a text message. This means that if you limit yourself to calls and email, you could be missing out on a large segment of your audience. Text message campaigns can be used for more than just sending property information. They can also be used to coordinate property visits, communicate loan information, and so much more. An effective SMS marketing campaign will help you drive growth, coordinate with fellow agents, and provide new value to your leads and customers. Here are just a few different types of strategies that you can implement quickly and easily. Prize incentives are a great way to get customers to help create content. For example, you could have them take pictures of homes they are interested in or a home that they just purchased and text it to a short code with a keyword to enter to win a prize. SMS messages can help you keep your customers in the loop. You can share home improvements, information about new listings, pictures of the neighborhood, upcoming neighborhood events, and so much more. Text marketing is powerful, and it’s incredibly simple to get started. In fact, it only takes a few minutes to create your account at EZ Texting and start sending your first messages. You know the saying — a picture is worth a thousand words. When it comes to real estate listings, the images that you use should tell a very compelling story about the property. When you include video, the story is much more powerful. 76% of marketers say it’s increased sales. 76% of marketers experienced more support queries after using video in their strategy. In all of your photos and videos, be sure to add some additional context. For example, you might include some information about the local neighborhood. Be sure to add some supporting images showcasing local businesses, grocery stores, parks, and more. Do a series of Instagram stories that show the interior of a property that you’re selling. 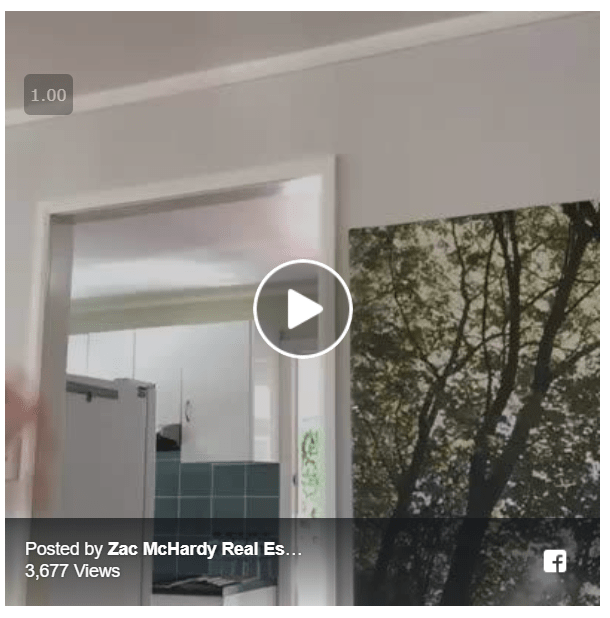 Share a Facebook or YouTube Live video during your open house. Create a YouTube video that walks someone through the step-by-step process of buying a home. Do a 360-video walkthrough of a property. Here’s an example of a video that was created by Zac McHardy. He used a Q&A to promote his company. Hosting a virtual tour of a home can be a very successful part of your digital marketing strategy. All of the other hacks that we talked about so far come together in this one. You can broadcast your virtual tour on social media channels like Facebook and YouTube. Then, when it’s over, you can post it out on your website with social sharing links. An SMS campaign can be set up to notify subscribers when the virtual tour starts. Finally, the tour itself will be done using high-quality video. Purchasing a home is a big decision. As a real estate expert, your job is to make that Journey as easy as possible for your client. To do that, your virtual tour should include real footage of the home, it should be interactive and work across mobile devices and computers, and it should be very user-friendly. Now that you have learned five effective ways to boost your digital marketing as a real estate agent, it's time to get started implementing these strategies. If you want to get ahead of your competitors and sell more homes, then it’s time to choose a marketing channel and master it. Text message marketing is the communications channel of choice for top real estate agents. 98% of all text messages sent through our platform are read by the recipients, and 90% of those are read within the first three minutes. You won’t find stats like that with email, social media, print, or any other marketing channel. At EZ Texting, we have had the privilege of helping many agents just like yourself get started with SMS marketing and achieve amazing results. We have combined all of that knowledge into our Real Estate Playbook. Download your copy today and get a jump start ahead of your competitors.